Getting your feet clean in the shower isn’t always the easiest. Do you ever find yourself leaning down trying to balance on one foot to clean the bottom of your feet? How safe can this really be if you are standing on a wet shower floor? A good way to combat that is to get a shower foot scrubber mat. They help to exfoliate your feet and keep them clean and also provide a safe way for you to keep your footing in the shower. Of all of the different foot scrubbing mats that we reviewed, we decided that our favorite is this Loofah Shower Mat with 60 individual suction cups. With so many different options for shower mats, we came across a few others that we really liked as well. Take a look and see what you think. 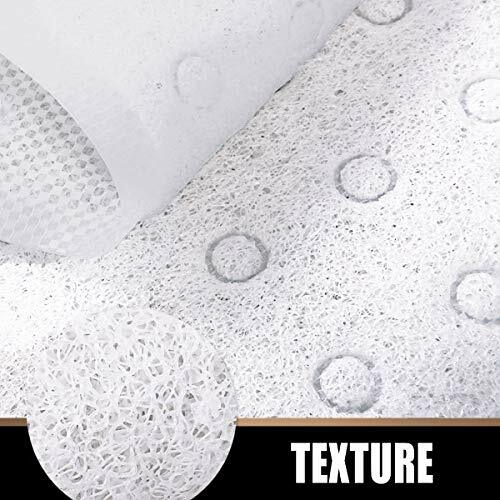 This shower mat is made up of loofah style material, giving it a great exfoliating result. 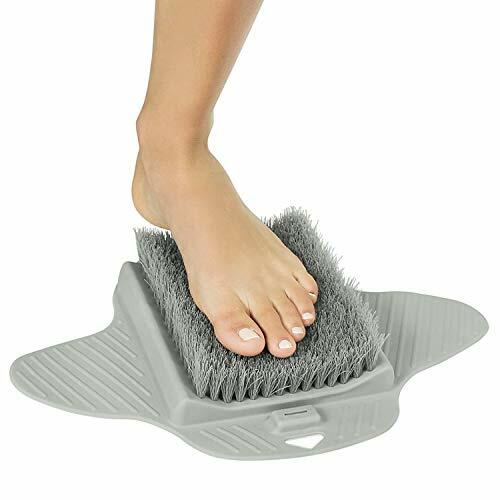 The good news, however, is that unlike other scrubber mats it is soft and pliable, so it won’t kill your feet when you shower. It also has some other great features that you will want to be aware of. You don’t just get the bath mat. It is made up of mildew-resistant material that will prevent the growth of bacteria and other germs, as long as you keep it clean and dry. It covers a large area of 29×17 inches. This means that it can nearly cover the entire shower floor of most average size showers. Comes in three different options with a varying number of suction cups (up to 60) making it safer for the shower. It will not stay secure in the shower floor if you do not have a smooth surface. That means if you have stone or marble flooring, it may not be safe. If it covers your shower drain, it may cause the water in the shower to drain slower than it should and water may pool up in the bottom of the shower. Read reviews from shoppers who bought this loofa shower mat on Amazon. 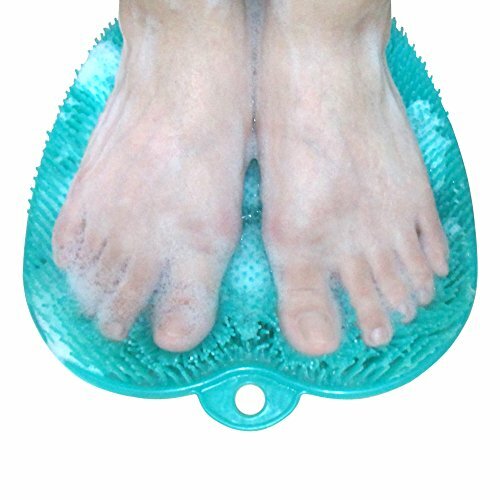 If you don’t want to stand on the scrubber the entire time you are showering, then this may be an ideal choice. It is small and can go in the corner of your shower just to be used to clean your feet. It also gently massages your feet, helping to improve circulation. It has bristles that help to scrub your feet, and these bristles are designed to work to get between the toes with your longer bristles. You can wash both feet at the same time, as it is designed for you to fit both of them on the mat together. It can even be used outside of the shower to help massage and apply lotion to your feet. Some buyers have noted that it has a very odd smell when it is first unpackaged, but this smell tends to fade away after using it for a little while. It may not be ideal if you have really big feet, because of its size. This shower rug made by Jobar is another large bath rug that helps to keep your feet clean as a whistle. It is actually like putting carpet in your shower, except it is sanitary. It is ideal for children and elderly people as well, because it offers a non-slip grip. The material is very quick to dry, which keeps moisture from building up and prevents it from growing bacteria. It is also really easy to keep it clean. There are many different suction cups that help to keep it in one spot on the shower floor, which helps you to keep your footing easier. It is machine washable, so you can just throw it in the washer if you ever need to get it extra clean. Like most bath mats, it is not ideal for textured floors. If you try to use it on a textured shower floor, then it may cause you to slip and fall. It doesn’t dry on its own. It does require you to hang it to dry to keep it in the best condition. 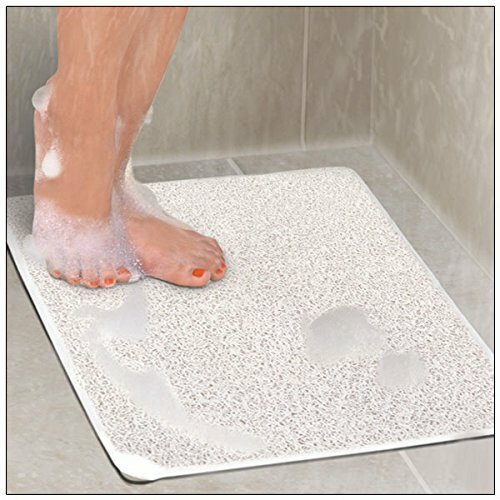 The HiSpirit Foot Scrubber Non-Slip Anti-Bacterial Rectangle Bath Mats are made of vinyl that is strong, durable, and free from allergens. It comes in the perfect size for your bath or shower: 14 x 25 inches. Its surface features a soft grassplot texture, which isn’t just exfoliating but is also soothing and comforting to your feet. Tired from a long day of work? Suffering from standing all day? This is the right item for you. It’s also great for pregnant women who have endlessly tired feet. Feeling an insufferable itch? This gets the job done, too. The mat has 92 cushions that come with holes, allowing normal water circulation. The material is antibacterial and is guaranteed to stick on smooth surfaces. Please take note before making a purchase, because this won’t work as well in tiled or textured surfaces. The LOVE, LORI Shower Foot Massager contains hundreds of bristles that are designed to scrub your feet. You will end up with a nice and thorough cleanse and exfoliation. The bristles are able to cover all of the underside of the foot, even areas that are usually difficult to get into. And you won’t have to adjust or angle your feet in awkward positions. It’s just like getting a foot spa – right in the comfort of your home, whenever you want to. It’s great for aching and tired feet. It massages pressure points for relaxation. The amount of pressure will be completely up to you. Another health benefit of this massager is it promotes leg and foot circulation. Aside from relaxation and soothing, it is effective in getting rid of unwanted foot odor. This is because it is efficient in cleaning and exfoliating dead skin cells. 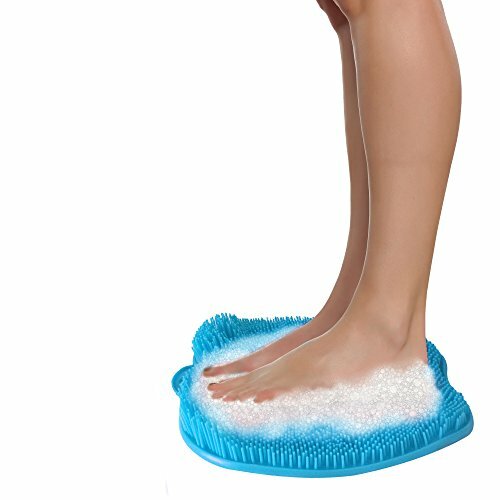 The California Home Goods Shower Foot Scrubber & Massager is made for having your own foot spa at home whenever you want. You don’t need to leave home to get a nice foot scrub and pamper yourself. It is an efficient toe scrubber, heel callus remover, foot massager, and heel dead skin remover. You can even do it every time you shower or take a bath. The scrubbing and massaging aren’t just about relaxing – no matter how great that sounds – because it causes a lot of health benefits as well. For one, it stimulates the circulation in the leg and foot. Better circulation gives an overall positive feeling of wellness, and it makes you feel less tired. Some users have reported that this massager also helped alleviate the symptoms of athlete’s foot, foul foot odor, and calluses. This is thanks to the scrubber mat’s high-quality material. It is good in exfoliating and removing dead skin cells. The scrubber comes with heavy-duty suction cups that keep it in place during bath time. This way, you can brush your feet on mat no matter how hard you want without dislodging the mat. You don’t have to worry about slips and falls. The Vive Foot Scrubber Brush features dual bristles, which are more effective than other models in the market. One layer of bristles – outside the scrubber – are stiffer and can smoothen calluses and rough skin. Another layer of bristles – inside the scrubber – are more gentle and soft, designed to cleanse and massage between the toes and tender soles. As a result, you get relaxed and rejuvenated feet and legs. Use it to promote normal circulation in the lower body. The mat comes with a strong suction cup base. This keeps it in place, on the floor of your shower stall or tub. This keeps you safe while scrubbing and bathing – a must-have for those with hip, knee, and back problems. The material used is free from latex, antibacterial, and mold and mildew resistant. Simply hang it using the hanger hole to dry it completely in between uses. This way it’s always ready to go when you want to use it. It comes with a 2-month guarantee, which lets you return it and get replacements no matter what your reason is. 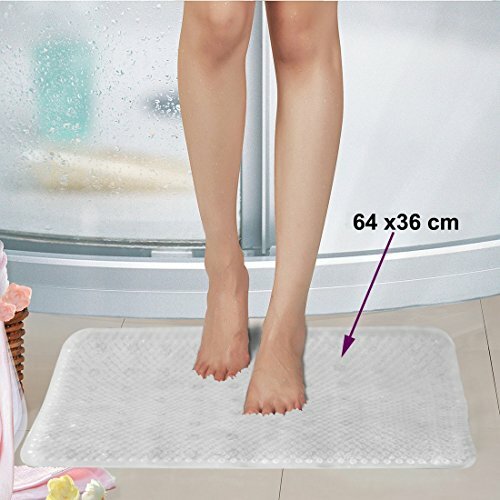 The first thing that you will want to look for when choosing a mat for your shower, whether it is for foot scrubbing mat or not, is a non-slip grip. Non-slip grip on the bottom of the mat will help to keep you safe while you are in the shower. Just remember, sometimes these type of mats do not work well in a shower with an uneven surface. It is also a good idea to look for one that is antibacterial. Bath mats tend to stay wet for a while, which means they are more prone to growing bacteria and other germs. Choosing an antibacterial material will definitely help to keep your shower mat more sanitary. Also, consider the size and shape of your foot scrubber mat. Some people don’t like the way that they feel on their feet while they are showering, but do like to have it for cleaning the bottom of their feet. This is when a smaller mat may be handy. It can stay in the corner of the shower so that it is only used when you need it. Other people may prefer a larger mat, for added padding under their feet while they shower. This really is a matter of preference, but still, something to consider. As you can see, there are some really good shower foot scrubber mats out there. If you want something that offers just about everything that you could need, from an antibacterial non-slip design to a soft and plush, yet still exfoliating texture, then opt for the Mayshine Loofah Shower Mat. The bonus back scrubber and loofahs are just an added perk of choosing this one. 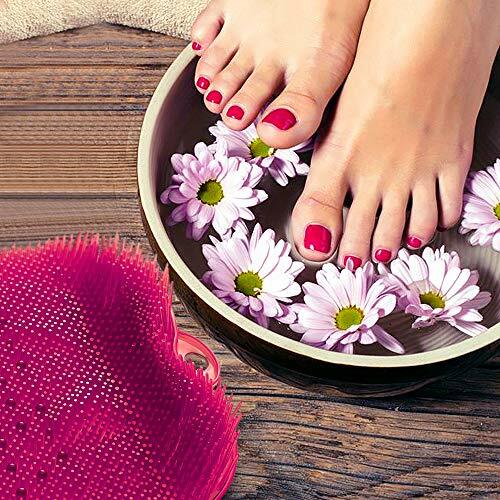 Picking the right bath scrubber mat for you isn’t just a nice addition to your home, it can also save you money and energy from having to get professional foot spa and pampering services elsewhere. Enjoy and have healthier, happier feet!